"Directoire" is the name we use today for the sets with abstract knights that, historically, can be placed between and along the "Encyclopedia" and "Régence" sets. These sets do give a lot of misunderstanding about the Knights and Bishops. The source of this confusion is the well known drawing in the encyclopedia of Diderot/D'Alembert, where the taller Knight is placed between Queen and Bishop. However the descriptive text, which obviously is missed by many, is very clear about the Knight ("Cavalier") en Bishop ("Fou"): the taller piece is the Knight and the piece with triangle collar is the Bishop. But in real live the sets were often used with swapped Knights and Bishops I suppose. "Directoire" sets have been made from beginning of the 18th century until the end of it. Because the knights don't need to be carved are these sets easier to make and a cheaper alternative for the "Régence" sets. Because of the rarity, that is not true anymore! The first "Directoire" set displayed here is early to mid 18th century and does still have the original box. Only a few of these boxes survived. Not many complete sets as well. "Lyon" sets are called after the city Lyon, but it is not known whether the sets actually were made there. The "Lyon" sets have been produced in same period as "Directoire": from beginning 18th century till the end of it. You see bone sets as well as sets of wood with bone combined. I do not know of ivory "Lyon" sets. One typical pattern of this type is the so called "Inverted Lyon" pattern, where bodies seem upside down and Kings and Queens have bone skirts to their bellies. I think the term "Inverted Lyon" was coined by our old friend Garrick Coleman. He certainly claimed it and thought he would at least be remembered for this if nothing else. "Régence" sets are called after "Café de la Régence", a famous chess café in Paris from 18th century till 1910 when it became a restaurant. In the café they used this type of set. Main difference with "Directoire" sets is the figural Knight. Note that Keats and some others call these sets "St.George". The "Régence" sets have been produced from 2nd quarter 18th century till even today. It was the most widely used pattern, certainly at the continent, as standard before the "Staunton" sets took over. In 1924 the FIDE declared "Staunton" as standard for their tournaments as well, after which the "Régence" style was used less and less. It is not easy to date the sets accurately, because of their long production period in both France and its colonies as well as in other countries by many manufacturers. Generally spoken, the sets evolved from tender fragile pieces to thicker ones. This applies to all aspects like the stems and finials. Knights heads became less tall and Rooks more straight. Bishops did not change that much further, although they lost their cuts at the collar in due time. Pawns evolved from having a very small, or even almost absent, collar to wider ones and to an extra small collar in the stem, as we see in 20th century sets. Most of the Régence sets have been made of boxwood, only occasionally combined with either ebony or rosewood. Ivory and bone sets are known as well. Ivory sets can be very beautiful. The one listed here is one of my favourites, and I do consider it the finest set I do have in my collection. The pewter set has turned pieces and hand-carved knights. You can see the turning marks on the pieces. The set was bought in England, but the shape is almost identical to the French Régence sets of late 19th till early 20th century. I must assume it is French. 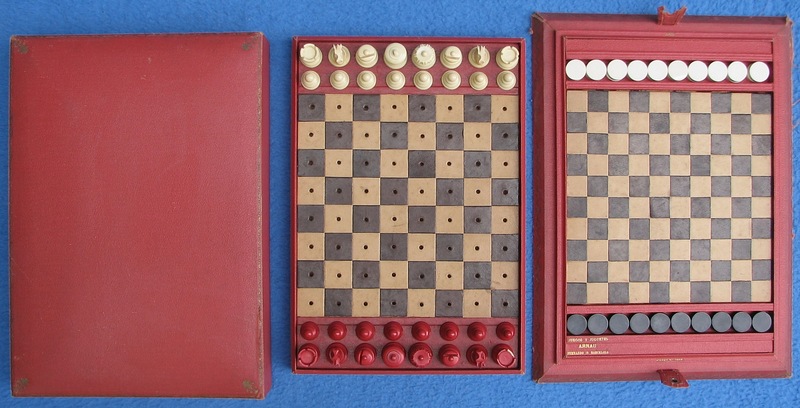 The 3 late 19th or early 20th century wooden sets are very common and were in use in chess clubs as well. Sometimes I do see a set where the bottoms have a number. Chess clubs did that trying to keep sets together. That didn't work always, as sets with different numbers on the bottom proof. You see this mixture also at Staunton chess sets used in clubs, even at Jaques sets. The last 3 sets are early 20th century sets. The Galalith "Régence" set is hard to find complete with cassette and board. That board is the only one I have seen! Some pieces are glued, but that does not distract from the beauty of this set, which is one of my favourites. At time of production these sets must have been expensive. The material was quite new and trendy and the pieces all had to be made by hand. Especially the knights are beautifully carved! No wonder you don't see much of these. The set is bought in England, so maybe made in England? "Staunton" sets have been made in France as well. The area around St.Claude in the Jura, because boxwood is present in huge quantities, is important for chess set manufacturing in the late 19th and 20th centuries. Henry Lardy, being the biggest, Henri Chavet, Michel Roz, Vauchier et fils and Jurabuis are all chess set manufacturers. Next to "Staunton" they did also produce "Régence" sets. In my French "Staunton" sets you see several Galalith sets. I do not know the makers of these sets, not even if they were produced in the Jura or by one of the makers mentioned above. But I think these sets are collectable, although many collectors do ignore them! Set "Made in France" for "Juegos y juguetes", "Arnau", "Fernando 18 Barcelona"
The Staunton chess set from 1968 was a gift of my parents and I used that set many years to play with. I simply did not have another playable set! It was not my very first one, that one is lost, but the longest present in my collection. 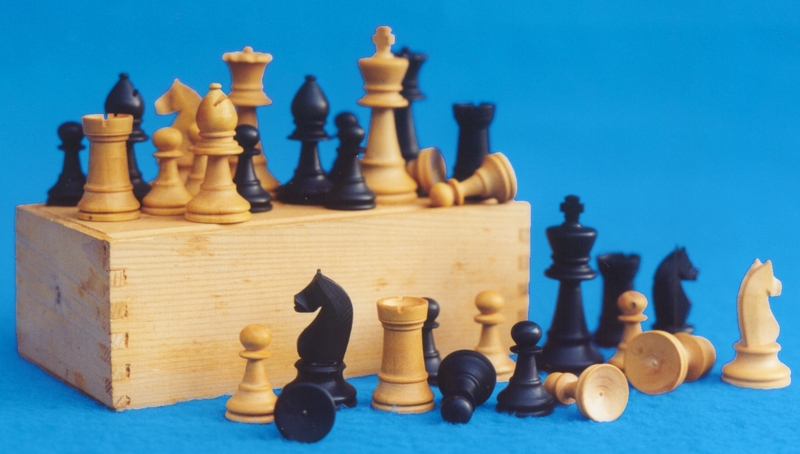 The 1970 chess set is an ordinary boxwood "Staunton" set, made by one of the makers in the Jura. I do not know who, but if someone knows, please tell me. This set is equal to my first set that I used to learn chess with. Or maybe it is just a bit larger than my lost set. In my childhood I could only afford a small set! The Chavet chess set from 2000 was a gift of Nicholas Lanier when I visited him august 2016. Maybe the white pieces are Olivewood? France, by Chavet Chess, "Staunton"
At last there is a set which easily could be used as travel set as well. Not to say it is a travel set. 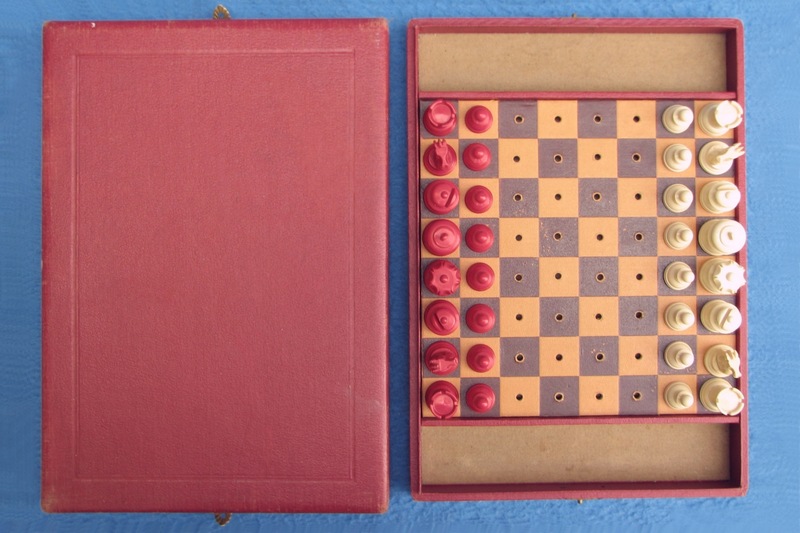 Didn't want to omit those in my French playing chess set pages.